Spring Savings to Get You Ready for Summer! Laser Hair Removal: Make Summer Shaving a Breeze! Purchase a package of 4 treatments and receive a second area of equal or lesser value FREE! That's right, you can purchase a package for your bikini line and get your underarms done for FREE! Start Growing Long, Summertime Lashes, No Mascara Required! Spend $1000 on any injectable treatment and receive a FREE 3ml bottle of Latisse! Purchase Vivier Peel for $125 and receive 25% OFF your summer skincare essentials! Clean up your complexion of brown spots and broken blood vessels: 15% OFF Laser Rejuvenation treatments! Go make-up free this beach season! Don't miss out on these amazing deals! Offers available until May 31, 2019. Contact our office for the most up-to-date specials and promotions. What’s available? The 90s started a trend in minimally invasive procedures in plastic surgery. Botox® became very popular, but only lasts three to six months and can be very expensive in the long run. Most wrinkle fillers are also temporary and costly. Most lasers and IPL (intense pulsed light) treatments require multiple visits for increased total cost and modest results. The new barbed threads were released and now, years later, there is still no great long-term follow-up scientific data published to support cosmetic improvement. The different generations of these threads are still being modified, as there are still many problems to be worked out. While plastic surgery produced the most impressive permanent results, it was often too extreme, until now. The optimum mini lift has now been established with excellent long-term results. Tens of thousands of men and women have been thrilled by this new type of mini facelift. It is not a facelift. There is a much shorter “down-time.” There are no harmful gases or general anaesthetic. The entire procedure is performed in Dr. Huq’s office in an hour or so, and you will never step foot in the hospital. Most impressive is the cost, at less than half of a full facelift. OptimumLIFT™ is a cosmetic surgery he adapted from the "Lifestyle Lift" practiced in the United States. Dr. Huq is the only physician in Ontario to perform the surgery, he said, which takes about one hour and requires less recovery time than a traditional facelift. Dr. Huq has been performing the surgery at the Niagara Plastic Surgery & Laser Centre for about a month (at the date this article was originally printed), and so far, he is pleased with the results. More importantly, his patients, such as Niagara Falls resident Joan Livingston, have received a fresh look with little side effects. When she first visited Dr. Huq's office, the 68-year-old Niagara Falls resident was unsatisfied with her sagging neck and double chin. She is retired, but wasn't prepared to wait at least two months to recover from a full facelift, so when she heard about the OptimumLIFT™, she thought she didn't have much to lose. "For me, it was a matter of self-esteem. It sounded like a fairly simple procedure," she said. After the surgery, Livingston said she experienced "some discomfort," but after a day of taking Tylenol, she felt fine. The bruising around her neck healed in about five days. Since her surgery, family and friends have told her she looks like she went away on a vacation. She has also been told she looks "refreshed." "My cheekbones are emphasized. It makes me feel more confident," she said. "To me it's a big change." Because incisions are made along the hairline and inside and around the ear, they are well-hidden, allowing patients to return to work after the surgery. The procedure tightens skin around the neck and lifts the jawline about two to three centimeters, resulting in a look Dr. Huq calls graceful, smooth and swan-like. Dr. Huq admits he could practice the procedure in larger markets such as Toronto or Los Angeles, but he prefers to stay close to home. "This is where I chose to be," he said. "My family is here. My kids are in school here. I'm here to serve Niagara." The Niagara Falls resident sees cosmetic surgery as a tool for Niagara's ageing population to be competitive in the job market. "No one has a month or two to recover from a traditional facelift, and people aren't looking for dramatic changes," he said. "They don't want extreme makeovers. It's good for a TV show, but that's about it." The procedure is permanent, unlike Botox® injections, which can wear off in three to six months. Additionally, the procedure costs about half the price of a traditional facelift. 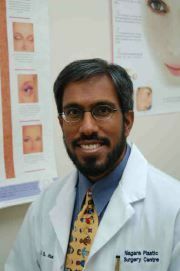 Dr. Huq's medical background involves more than cosmetic surgery. During medical school at Western University in London, Ontario, he conducted stem cell research and published a book. Before moving to Niagara, Dr. Huq lived and practiced reconstructive surgery in Toronto. He saw many victims of burns and congenital defects, and he has also re-attached limbs. "I'm not in this for money. I do this to fix things," he said. "I like to fix things — that is why I entered cosmetic surgery." While the surgery "can't fix everything," it will change the patient's self-esteem, which provides enough motivation for Dr. Huq to offer the surgery to patients across the province. He plans to arrange transportation to his Niagara Falls clinic for patients from Toronto and welcomes anyone to visit him for a consultation. "I don't encourage anyone to have work done, but this makes people feel good and that's important," he said. *Disclaimer Similar and/or permanent results are not guaranteed based on the treatment/procedure and may vary from patient to patient, based on multiple factors, including genetics and lifestyle of each patient. Please note that the Medicine Act, 1991, Part II: Advertising Regulations restricts and regulates advertising by physicians in Ontario. Compliance with these regulations restricts advertising and promotional content. Accordingly, the content of this website is intended for educational and informational purposes only, as the internet is an electronic information system and you are viewing this page unsolicited. * If you require any further information to learn how our office is fully compliant with Ontario’s Personal Health Information Protection Act, please contact us to connect with our Health Information Custodian. Disclaimer: Please note that individual results of cosmetic procedures may vary.